When should I seek medical care for hydronephrosis? What are the complications of hydronephrosis? Hydronephrosis describes swelling of the kidney resulting from the inability of urine to drain from the kidney into the bladder. Hydroureter describes swelling of the ureter, the tube that connects the kidney to the bladder. The obstruction may occur at any level in the urinary collecting system from the kidney to the ureter to the bladder to the urethra. Depending on the location and cause of the obstruction, hydronephrosis may be unilateral involving one kidney or bilateral involving both. The increased pressure caused by hydronephrosis potentially can compromise kidney function if it is not relieved in a reasonable period of time. Symptoms of hydronephrosis depend upon whether the swelling occurs acutely or progresses more gradually. If it is an acute obstruction, symptoms may include writhing pain, nausea, and vomiting. Treatment of hydronephrosis and hydroureter is aimed at restoring urine flow from the affected kidney. Hydronephrosis describes the situation where the urine collecting system of the kidney is dilated. This may be a normal variant or it may be due to an underlying illness or medical condition. Normally, the kidney filters waste products from blood and disposes of it in the urine. The urine drains into individual calyces (single=calyx) that form the renal pelvis. This empties into the ureter, a tube that connects the kidney to the bladder. The urethra is the tube that empties the bladder. While obstruction or blockage is the most frequent cause of hydronephrosis, it may be due to problems that occur congenitally in a fetus (prenatal) or may be a physiologic response to pregnancy. A large percentage of pregnant women develop hydronephrosis or hydroureter. Experts think this is, in part, because of the effects of progesterone on the ureters, which decreases their tone. 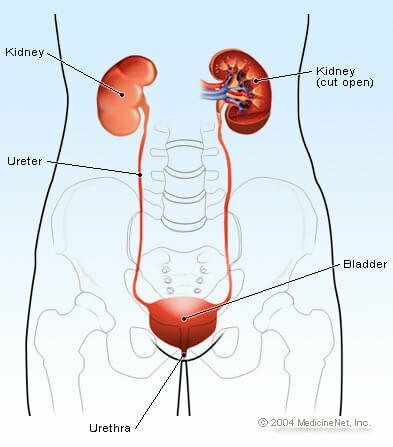 Technically, hydronephrosis specifically describes dilation and swelling of the kidney, while the term hydroureter is used to describe swelling of the ureter. Hydronephrosis may be unilateral involving just one kidney or bilateral involving both. A complication of hydronephrosis that is not physiologic is decreased kidney function. The increased pressure of extra fluid within the kidney decreases the blood filtration rate and may cause structural damage to kidney cells. This decrease in function is often reversible if the underlying condition is corrected but if the duration is prolonged, the damage is often permanent. There are numerous causes of hydronephrosis that are categorized based upon the location of the swelling and whether the cause is intrinsic (located within the urinary collecting system), extrinsic (outside of the collecting system) or if it is due to an alteration in function of the parts of the urinary system. Kidney stone. Likely the most common reason to have unilateral hydronephrosis is a kidney stone that causes obstruction of the ureter. The stone gradually moves from the kidney into the bladder but if it should act like a dam while in the ureter, urine will back up and cause the kidney to swell. This would be classified as an intrinsic obstruction. The inability to empty the bladder (urinary retention) for any reason may cause bilateral hydronephrosis. Tumors or cancers that compress the ureter and prevent urine flow. Examples include lymphoma and sarcoma, especially if they are located in the retroperitoneum, where the kidneys and ureters are located behind the sac that contains the bowel. Prostate hypertrophy or swelling is a common cause of urinary retention and subsequent hydronephrosis in males. Neurogenic bladder or the inability of the bladder to function properly occurs because of damage to the nerves that supply it. This may occur in brain tumors, spinal cord injuries or tumors, multiple sclerosis, and diabetes among other causes. Vesicoureteral reflux where urine flows backwards from the bladder into the ureter. Prenatal hydronephrosis is an example, though it may occur at any time in life. There may or may not be direct symptoms of hydronephrosis depending upon the underlying cause. Individuals with acute hydronephrosis, for example symptoms from renal colic due to a kidney stone begin with an acute onset of intense flank or back pain radiating to the groin, associated with nausea, vomiting, and sweating. Colicky pain comes and goes and its intensity may cause the person to writhe or roll around or pace in pain. There may be blood seen in the urine. Chronic hydronephrosis develops over time and there may be no specific symptoms. Tumors in the pelvis or bladder obstruction may develop silently and the person may have symptoms of kidney failure. These are often nonspecific and may include weakness, malaise, chest pain, shortness of breath, leg swelling, nausea and vomiting. If electrolyte abnormalities occur because the kidneys are unable to regulate sodium, potassium, and calcium, there may be heart rhythm disturbances and muscle spasms. A person with acute hydronephrosis usually develops significant pain and needs emergent help with pain control. Blood in the urine is never normal and should not be ignored. Most often in women, it is due to a bladder infection, but other causes include kidney stones, tumors, and occasionally is associated with appendicitis. Individuals who have the diagnosis of hydronephrosis who develop a fever need to be seen immediately. If a urinary tract infection occurs and there is decreased urine flow, there is the risk of becoming very ill by developing bacteremia (blood stream bacterial infection). Hydronephrosis is a true emergency in patients with only one kidney and should the person believe that the lone kidney is at risk, urgent medical care should be accessed. The diagnosis begins with taking a history of the symptoms that the patient experiences. The health care practitioner will ask questions that will direct whether further tests need to be ordered. Reviewing the patient's past medical history and family history may be helpful. Depending upon the situation and whether there is acute onset of symptoms, physical examination may reveal tenderness in the flank or where the kidneys are located. The bladder may be found to be distended when the abdomen is examined. Usually, in males, a rectal examination is done to assess the size of the prostate. In women a pelvic examination may be performed to evaluate the uterus and ovaries. The following laboratory tests may be ordered depending upon what potential diagnosis is being considered. Electrolyte analysis may be helpful in chronic hydronephrosis since the kidneys are responsible for maintaining and balancing their concentrations in the blood stream. BUN (blood urea nitrogen), creatinine and glomerular filtration rate (GFR) are blood tests that help assess kidney function. CT scan of the abdomen can be performed to evaluate the kidney anatomy and make the diagnosis of hydronephrosis. It also may allow the health care practitioner to look for the underlying cause including kidney stones or structures that are compressing the urinary collecting system. Depending upon the situation and the health care practitioner's concerns, the CT may be done with or without contrast dye injected into a vein, and with or without oral contrast (that the patient drinks) to outline the intestine. Most commonly, for kidney stones, neither oral nor intravenous contrast is needed. Ultrasound is another imaging study that can be done to look for hydronephrosis. The quality of the test depends upon the skill of the ultrasonographer to evaluate the structures in the abdomen and retroperitoneum. Ultrasound is a non-invasive, quick procedure for screening purposes, and is also useful in women who are pregnant where radiation concerns exist. Intravenous pyelography (IVP) has mostly been replaced by CT scanning but does have a role in diagnosing some patients and its use is now limited. KUB X-rays (an X-ray that shows the kidney, ureter, and bladder) are used by some urologists to classify a kidney stone as radiodense or radiolucent and may use KUB X-rays to determine if the stone is able to migrate down the ureter into the bladder. The goal of treatment for hydronephrosis is to restart the free flow of urine from the kidney and decrease the swelling and pressure that builds up and decreases kidney function. The initial care for the patient is aimed at minimizing pain and preventing urinary tract infections. Otherwise, surgical intervention may be required. The timing of the procedure depends upon the underlying cause of hydronephrosis and hydroureter and the associated medical conditions that may be present. For example, patients with a kidney stone may be allowed 1-2 weeks to pass the stone with only supportive pain control if urine flow is not completely blocked by the stone. If, however, the patient develops an infection or if they only have one kidney, surgical intervention may be done emergently to remove the stone. Shock wave lithotripsy (SWL or extracorporeal shock wave lithotripsy) is the most common treatment for kidney stones in the U.S.. Shock waves from outside the body are targeted at a kidney stone fragmenting the stone into tiny pieces that are able to be passed out of the urinary tract in the urine. For patients with urinary retention and an enlarged bladder as a cause of hydronephrosis, bladder catheterization may be all that is needed for initial treatment. For patients with ureteral strictures or stones that are difficult to remove, a urologist may place a stent into the ureter that bypasses the obstruction and allows urine to flow from the kidney. Using a fiber optic scope inserted through the urethra into the bladder, the urologist can visualize where the ureter enters and can thread the stent through the ureter into the kidney pelvis bypassing any obstruction. When a stent cannot be placed, an alternative is inserting a percutaneous nephrostomy tube. A urologist or interventional radiologist uses fluoroscopy to insert a tube through the flank directly into the kidney to allow urine to drain. Some conditions, for example retroperitoneal fibrosis or tumors, may require steroid therapy, a formal operation or laparoscopy to relieve the hydronephrosis or hydroureter while oral alkalinization therapy may be used to dissolve uric acid kidney stones. If hydronephrosis remains untreated, the increased pressure within the kidney may decrease the ability of the kidney to filter blood, remove waste products, and make urine as well as regulate the electrolytes in the body. Hydronephrosis can lead to kidney infections, and in some cases, complete kidney function loss or death. Kidney function will begin decreasing almost immediately with the onset of hydronephrosis but is reversible if the swelling resolves. Usually kidneys recover well even if there is an obstruction lasting up to 6 weeks. The term acute hydronephrosis may be used when, after resolution of the kidney swelling, kidney function returns to normal. Chronic hydronephrosis refers to the gradual development of the obstruction and the slow loss of kidney function. Since hydronephrosis is a situation that occurs because of an underlying cause, prevention depends upon avoiding the underlying cause. For example, individuals with kidney stones that cause ureteral obstruction and hydronephrosis may try to decrease the chance of a recurrent stone by keeping well hydrated. "Hydronephrosis and Hydroureter." eMedicine.com. Updated July 18, 2016. Mulhollad MW, et al. Greenfield's Surgery Scientific Principles and Practice. 4th edition 2006 Lippincott Williams and Wilkins.